Enter mosaic knitting, which is a fun and easy method of colorwork and my current favorite. It’s knit in two-row stripes. Patterns are formed by slipped stitches carried up from the color below. 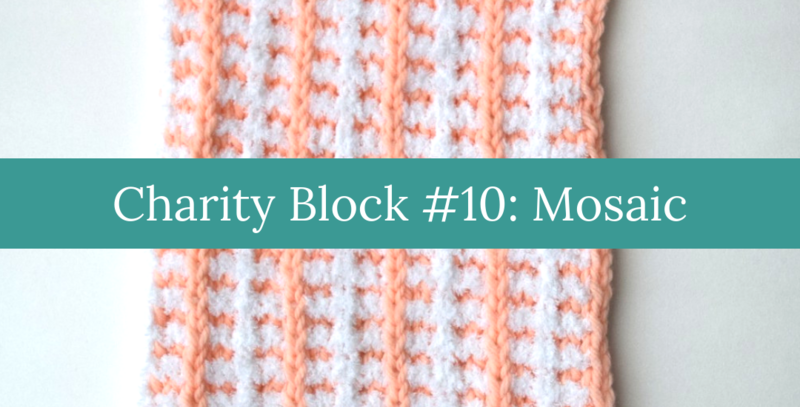 I decided to try this charity block with two different textures of yarn. I don’t usually like peach or fuzzy, but I somehow ended up loving the combo. You can try it with plain worsted weight acrylic or with a fuzzy worsted acrylic—it’s fun either way. You can follow either the chart or the written instructions. If you follow the chart, remember to follow it from right to left for the odd rows (the rows are only numbered with odd numbers), then follow the same row of chart from left to right for the even rows. 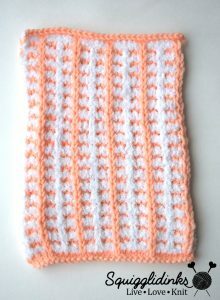 Worsted weight acrylic yarn in 2 colors, A (I used fuzzy white) and B (I used peach). With color B (peach), cast on 30 stitches. Still with color B, knit 1 row, then purl 1 row. With color A (white), row 1: (k1, sl1, k4), repeat to end. With color A, row 2: sl1, p3, sl1, p1, *p4, sl1, p1, repeat from * to end. 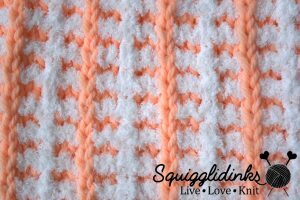 With color B (peach), row 3: (k4, sl1, k1), repeat to end. With color B, row 4: sl 2, p4, *p1, sl1, p4, repeat from * to end. Repeat these 4 rows until block measures 9 inches. Last two rows should be 1 row knit, 1 row purl, with no slipped stitches, just like the first two rows. Bind off.